She would be 56 today. I made her every year. Gorgeous card Fiki. Thinking of you. This brings tears to my eyes every year. So sad that you no longer have your mother here with you. You made a beautiful card for her, Fiki. 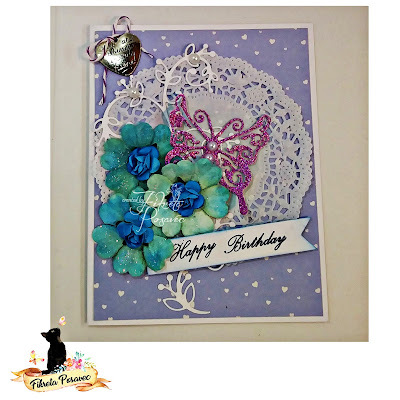 I love all the layers and the gorgeous butterfly! This is beautiful. Love the colors and design. Sending you hugs. So pretty! Love the gorgeous flowers and the bright butterfly. You made a beautiful card for your Mother. So sorry for your loss Fiki, gorgeous card.